It seems that this schizophrenic weather has clearly taken its toll on my immune system. breaking down my defenses and leaving me vulnerable and in a state of mere confusion. You know that if there is one thing I detest, it is being sick and yet, here we are. Despite the many hand washes and habitual usage of hand sanitizer, I was unable to escape the little germs from doing their sugarplum dance. And now, here we are hacking and coughing, watery-eyed and chilled to the bone, buried beneath the blankets and drowning in the Vernors ginger soda which I stumbled upon at the local Kroger. Score! I think I’ll swing by the store later and grab some items to make soup. Chicken noodle perhaps? No need to go changing tradition. I mean, it’s the default, go-to soup of illness. I remember my mom breaking out a can of Campbell’s chicken broth and heating it to a temperature somewhere around “scolding” and pleading with me to drink (le sigh). But if there’s one thing anyone would long for during times like this, it’s the affection of a loved one whether it be a parental unit or spouse. I’m glad that Jenna was able to spend the day with me because if there’s one thing that stinks about being sick is ‘being sick alone’. Chicken Noodle Soup is one of my favorite things to indulge in. It doesn’t have to be prepared when you’re feeling ‘under the weather’ but maybe when you need a little piece of home or comfort. Its one of the many foods that evokes childhood memories for me and every now and again, we all need those warm moments to come by and stay for a spell. This recipe is really ‘off the cuff’, no Googling, searching cook books or inquiring of anything or anyone for their favorite version. Because I feel like chicken noodle soup should be in our mental rolodex and somewhat instinctive. 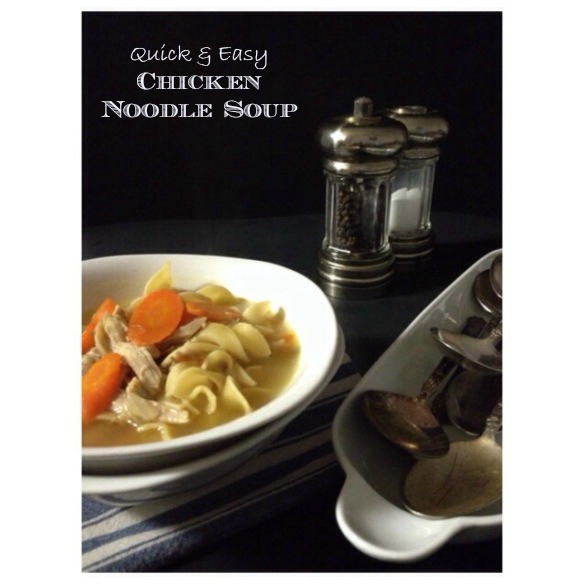 Your version might have celery, potatoes or maybe even a little curry but you have a chicken noodle soup recipe that will warm ‘the cockles of your heart’. So tell me, what’s your favorite ‘feel better’ soup? 1. Fill your stock pot with the water, bouillon cubes, onions, white pepper, butter and cook over medium high heat. Allow contents to come to a rolling simmer, stirring occasionally and then reduce heat to medium. After about 10 minutes, add your carrots. 2. Cook your noodles according to the recipe on the back of the package until al dente and then let them cool down. I like to cook them separately because they hold better for a couple of days without breaking down in your soup. And it will leave with some broth instead of your noodles continuing to soak it all up. 3. Add your pulled chicken meat and noodles, then allow the meat to heat through. Your soup is done at this point and ready to be consumed. Grab some saltines, a warm blanket and call it a day. Side Note: I already had some chicken leftover from a roasted bird. So feel free to buy a roaster from the store or cook your own. I always prefer cooking my own because I’m picky about the seasoning on it and I like to prepare more than one meal out of it. Yes! I stumbled upon it at the Kroger in Green Hills. And I’m so excited about it, I think I might stock up. I love the idea of warming it with a cinnamon stick. I think I’ll try it soon. Thanks! I either make a quick chicken soup or pick up the chicken with matzo ball soup from Noshville. I swear the Noshville soup will heal what ails you. All my family gets in when down with a cold or flu symptoms. Sometimes when you feel bad you also do not feel like cooking anything at all. I love your simple beautiful soup Charles. Thanks Teresa! I too, love the matzo ball soup at Noshville. And now, I wish I had a bowl! But yes, when I’m feeling ‘under the weather’, the quicker, the better is my policy.